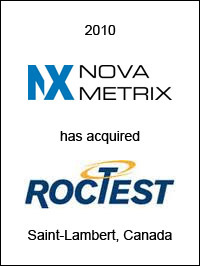 Nova Metrix LLC, Woburn, MA, has entered into a definitive agreement to acquire all outstanding shares of Roctest Ltd (TSX:RTT) for approximately $22.3 million. Based in Quebec, Canada, Roctest designs, manufactures and markets sensors and high-precision measuring instruments for the civil engineering market and applications in the energy, healthcare and process control industries. Nova Metrix, through its subsidiaries, provides measurement and control instrumentation solutions to customers around the world. EC Mergers & Acquisitions acted as exclusive financial advisor to Nova Metrix LLC on this transaction.